For any pattern that's built directly into CustomFit, a few selections in a drop-down menu are all that stands between you and a great sweater. If you want to start with something simpler, check out our collections of great, basic sweaters. If you're ready for more, create your own design with our Build Your Own sweater wizard. If you're bold and ready to dive in, take a look around! But if you want a little more guidance about how to get started with measurements, gauge, fit, and silhouette - you've come to the right place. Let you understand whether you like the fabric enough to want to wear it. CO between 35 and 50 stitches. Knit in the stitch pattern you'll use for the sweater, for at least 5'' ( 12.5 cm). BO. Wash and dry your swatch the way you'll wash and dry the sweater. Play with it! Do you like the fabric? Does it match what you have in mind? If so, you're ready to measure your stitch and row gauge. If not, try again - with different yarn, different needles, etc. I outline (usually with safety pins or dental floss) the number of stitches and rows that I think will give me good data. 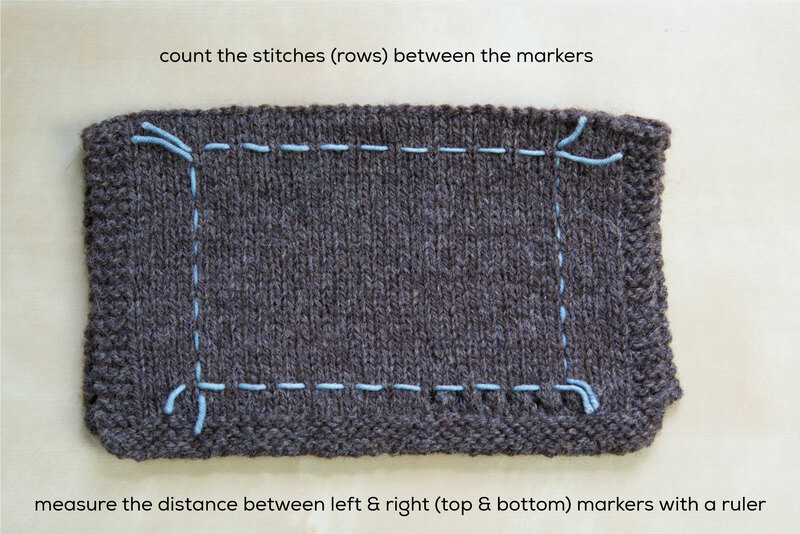 If your stitches close to the bottom edge are wonky, don't include them! Stay a few stitches away from the edge. However your swatch looks, identify the section that represents you knitting at your most relaxed and (dare I say it?) bored. Count the stitches between your marked edges (say, 26). Measure from one marked edge to the other with a ruler (say, 4.375 inches.) Enter the information into CustomFit in exactly this way. Do the same for your rows (say, 18 rows in 2.625 inches). That's it! CustomFit will take it from there. When taking circumferences, keep the measuring tape more or less level around you, and pull it snug enough that it won't slip. You can take all of these measurements yourself, and they're all you need - no stress! Once you have, you can save them in your CustomFit account and never think of them again. An oversized fit will have the same shoulders as relaxed, but will have substantial positive ease everywhere. For men and children, the fits are all a bit more generous than for women, with the exception of a men's close fit, which is quite close to the body. If you prefer, you can also customize the measurements of your sweater before creating your pattern by clicking the "customize fit specifics" button. I definitely endorse this approach, if you already know what you like! If you don't know what you like, give CustomFit's recommendations a try for your first sweater and adjust (if necessary) from there. Straight silhouettes have no waist shaping; the circumference at the hips is equal to that at the chest. 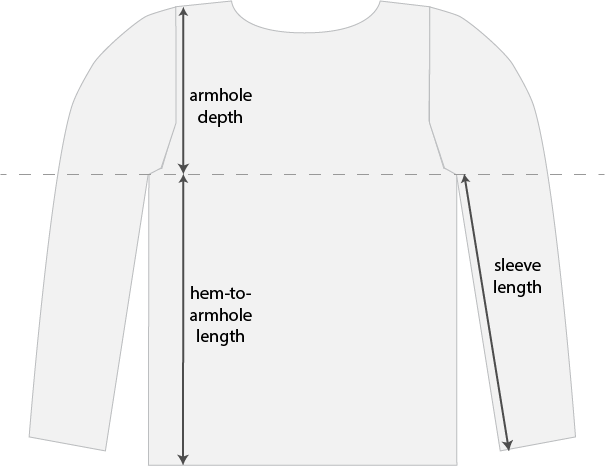 A-line silhouettes have a wider hem than bust/chest, and shaping is worked at the side seams evenly over the length of the body of the sweater. Tapered silhouettes have a narrower hem than bust/chest, with shaping worked at the side seams evenly over the length of the body of the sweater. These require a simple set of body measurements. Hourglass silhouettes include customized waist and bust shaping for your body. Designs are marked with their allowed shapes via small icons, and are typically pictured only in one silhouette. Create an account for free! You can store up to 10 sets of body measurements, and as many gauges as you like. Each pattern then costs between $10 - $12.50, depending on the complexity of the design. We also offer two subscription levels for knitters who like to change their mind (or make a lot of sweaters :). Maker-level subscriptions cost $5 per month, and the first 2 patterns you generate in any particular month are included. Maker Plus costs $8 per month, and subscribers get unlimited pattern creation. Both levels mean you can change your mind about what sweater you're knitting as often as you like! In addition to discounted patterns, maker subscribers get access to a set of handy knitting calculators, and monthly sweater lessons from Amy. The calculators are useful for changes to your CustomFit patterns and lots of other projects you might be knitting. They include a gauge calculator, a stitch pick-up calculator, a button band spacer, a sleeve cap generator, and a shaping placer - and this set continues to expand! Any's monthly lessons give you up close and personal advice from Amy about one aspect of sweater knitting. Please see our resources for new knitters, our advanced design resources, and our help center.